➀ Remove any existing polish. Wipe off oil remains using lint free cotton soaked with acetone, this is to prevent lifting as gel is sensitive to oil and is more likely to lift if there’re oil particles. ➁ File and buff to customer’s desired shape. 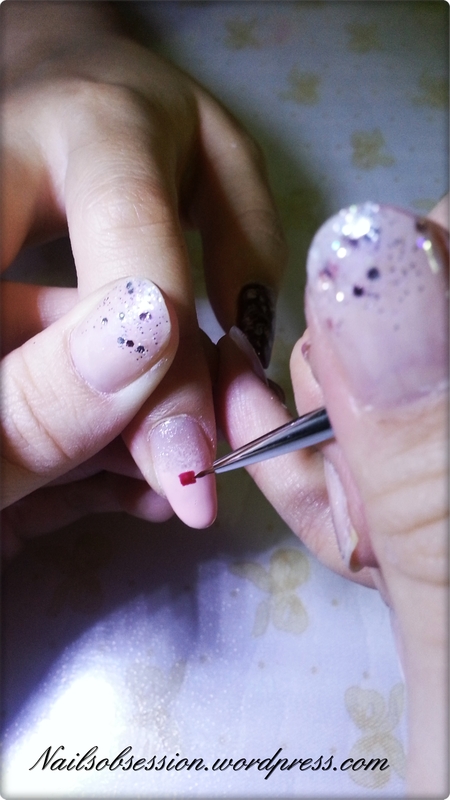 ➃ Pushing of cuticles. 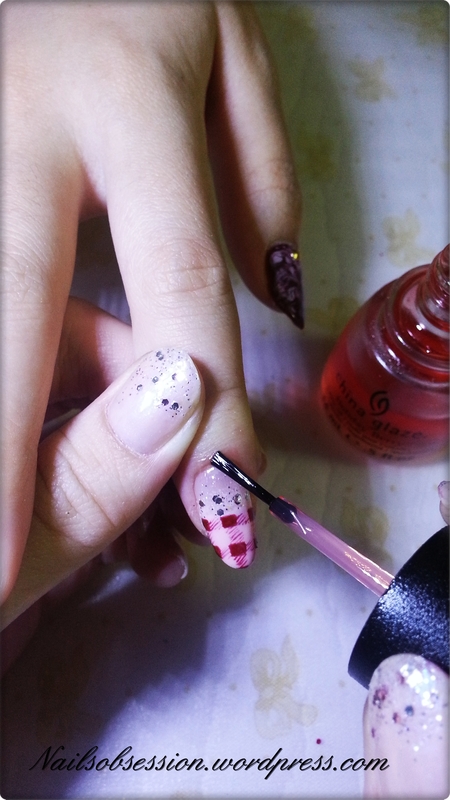 While doing gel manicures, we’re only allowed to execute dry pushing, no we’re not trying to save time or cleaning it sloppily. We only do wet manicures (i.e. 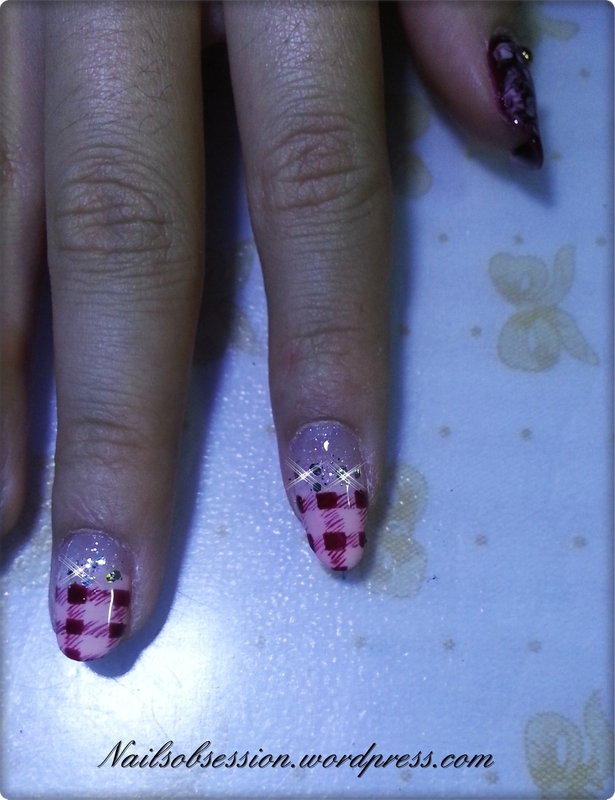 soaking of hand in hand bowl) when doing classic manicure. Reason being, doing dry pushing prevents fungus growth, they’re more likely to grow underneath gel if water particles are found in your nail! Even after drying your nails after a wet manicure, I’m confident enough to say that it will not be completely dry and it encourages fungus growth! Notice that quite a lot of salons do wet manicures when doing gelish, if you happen to visit a salon that does that, stop them and request for a dry push instead. Important tips for your own knowledge. ➄ Offshine. 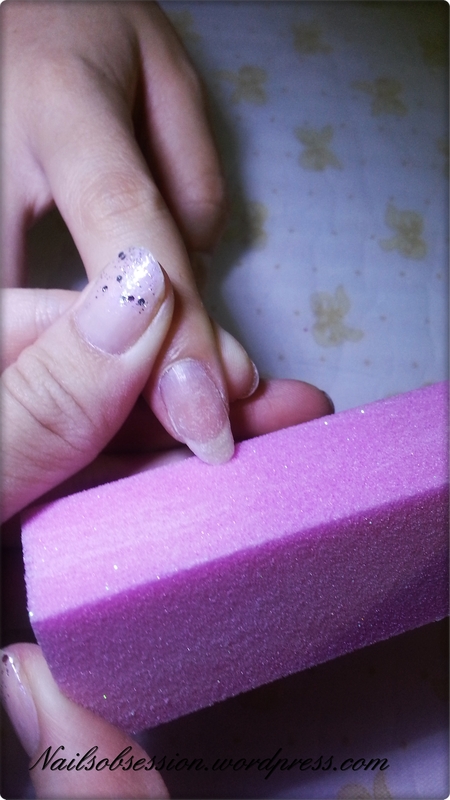 Using a block buffer or 180 grit file, lightly offshine nail surface. The purpose of offshining is to prevent lifting, generally gel is sensitive to smooth surfaces and may lift easily without this step. 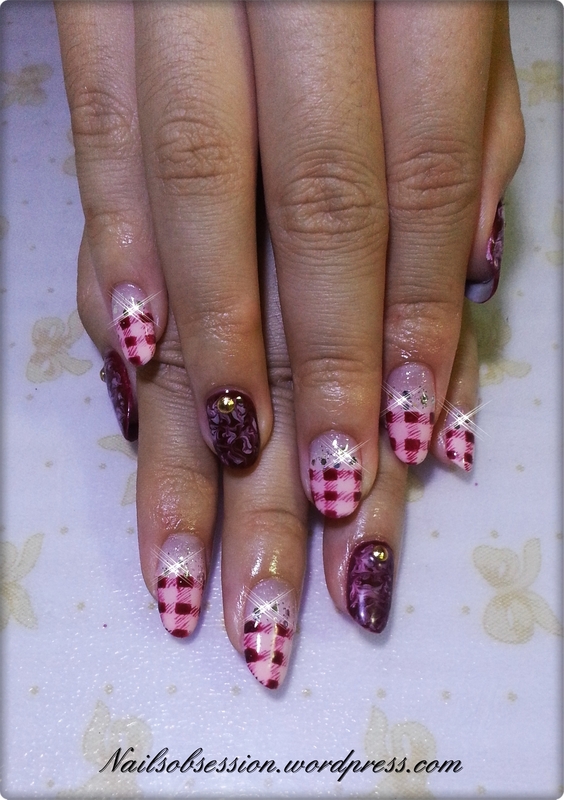 Note: do not offshine too roughly, it will hurt your nails, would only need to remove any smooth surface on nail. ➅ Dehydrate (Optional). 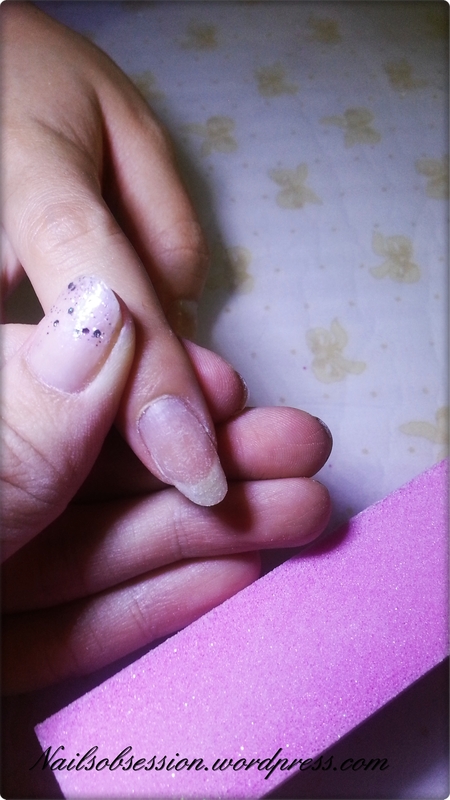 Further dehydrate nails to make sure that there’re no oil remains on nails. 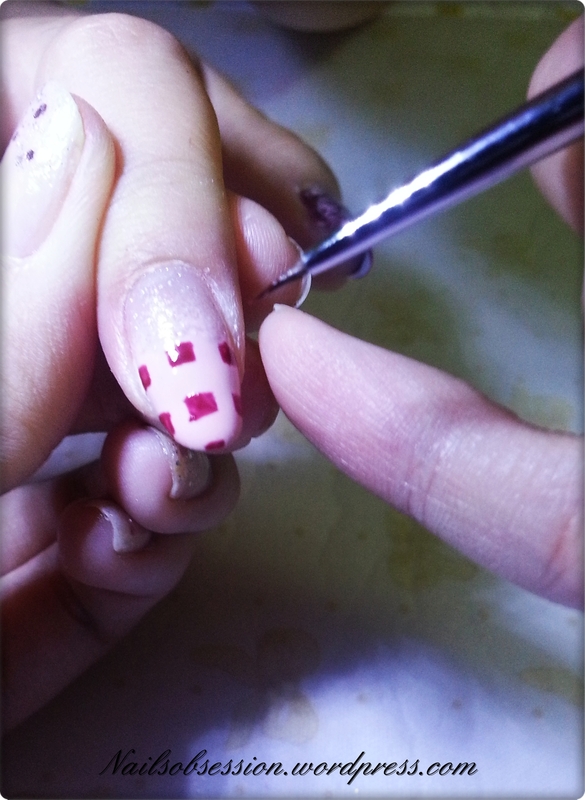 ➆ Apply a thin layer of base coat. Remember to seal the free edge to prevent chipping. ➇: Cure for 10 seconds (LED). I’m using an 6W LED lamp (bought if from Ying hehe) Cure for 30 seconds if using 36W UV lamp. ➉ Using a sponge, tap lightly to smooth-en harsh line and create gradient effect. ➀➀ Cure again. For colour shades, cure for 30 seconds if using LED, or 2 minutes if using UV. 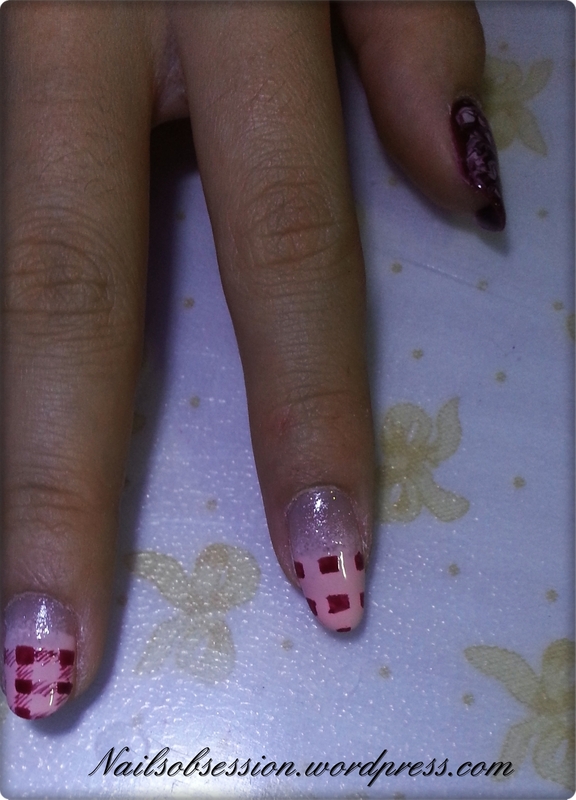 ➀➂a) Using a detailing nail art brush, draw a small rectangular box in the middle just at the edge of the gradient. 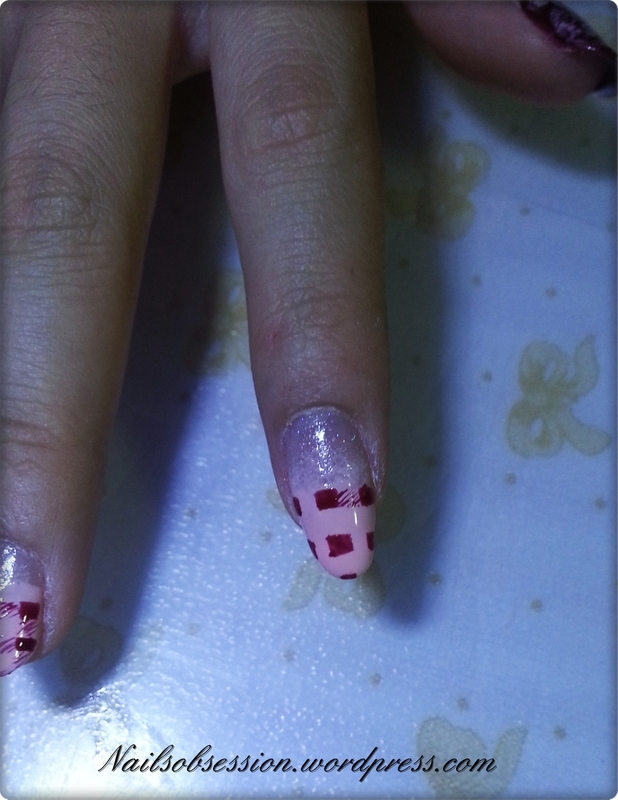 I’m using Angel Pro Gelly No 30 to draw the nail art. 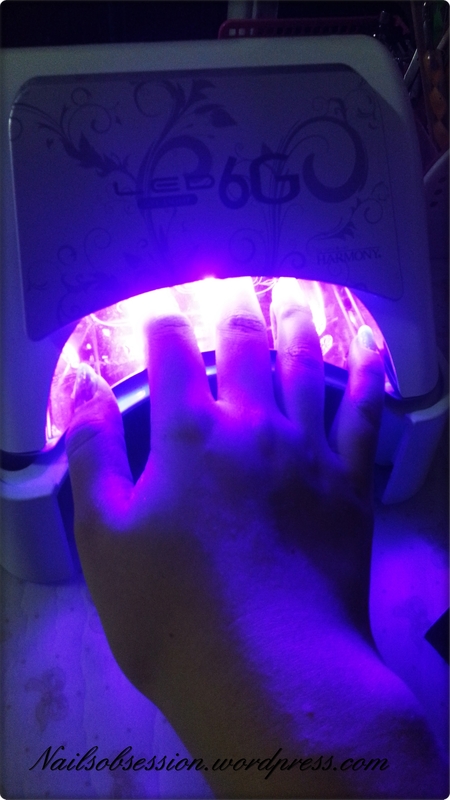 No need to worry about the polish drying up and screwing up the strokes, gel polishes do not air-dry and will only dry after curing under a UV/LED lamp. I’ve tried other brands of gel polishes and none of them works like Angel Pro when it comes to drawing detailed nail art, look at how opaque and clear each strokes are! 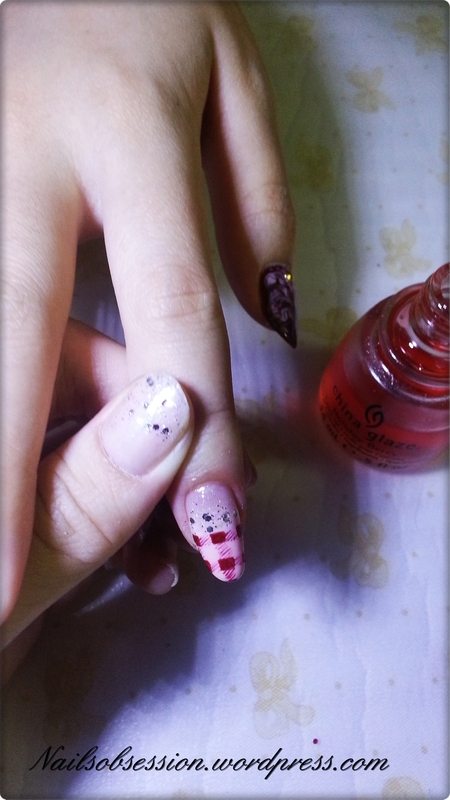 I never used to draw nail art using gel polishes bcos’ I didn’t like the soft and shady effect, which tends to “melt” away after curing. 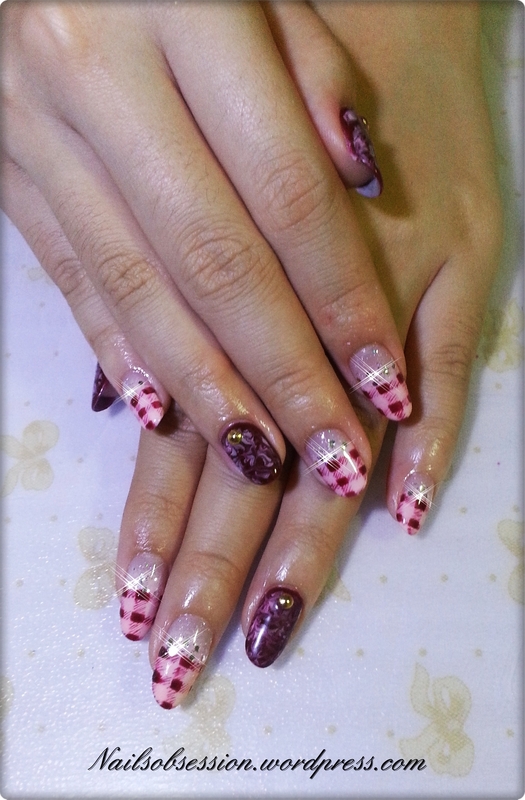 Unlike them, Angel Pro polishes creates a strong and defined colour which enhances nail art drawn. The only thing that I don’t fancy is the colours are quite limited, there’re only available in pastel shades for now but I’m sure they’ll be coming out with new colours soon! ➀➂b) Fill in all the rest of the boxes, align and leave a space in between each boxes. ➀➂c) Lightly create strokes in between the empty spaces. ➀➂d) Fill in the strokes and add in glitter. ➀➄: Cleanse. Remove the sticky layer using a lint free cotton soaked with cleansing alcohol. 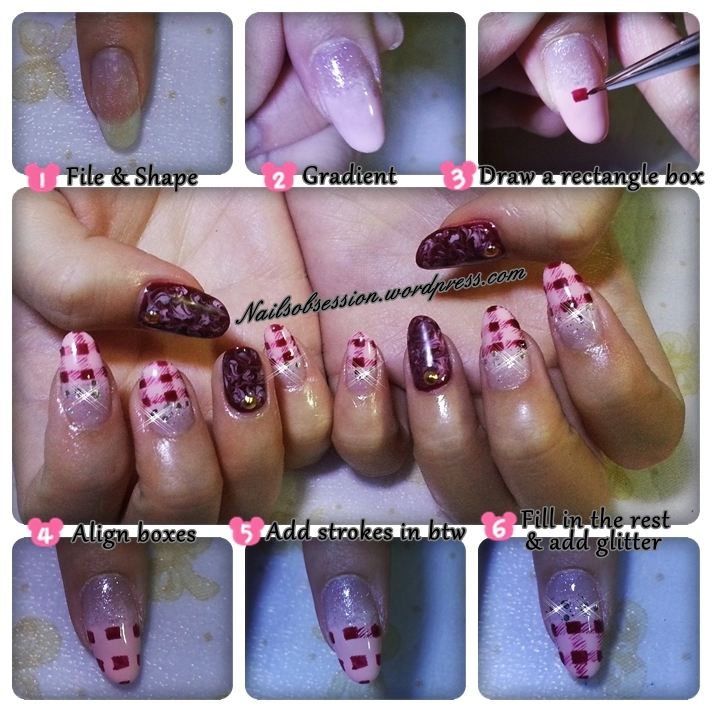 I know it’s quite a lengthy and wordy post, so I created a small summary on how to apply gel polish, and also how to create checkered nail art. Please note that you’ll have to cure every time you apply a layer to dry it, didn’t include the curing part after base coat bcos’ it should be known to all! P/S: All pictures are taken using PS’s new Samsung S3, I’m in love with the effect it created. The colours are so rich it fully captures the true colour! Boo to iPhone, I’m so switching to S3!!! hi my name is lisa and i would like to puchase angler nail gel but there are no distributors here in the us. How may i purchase them?